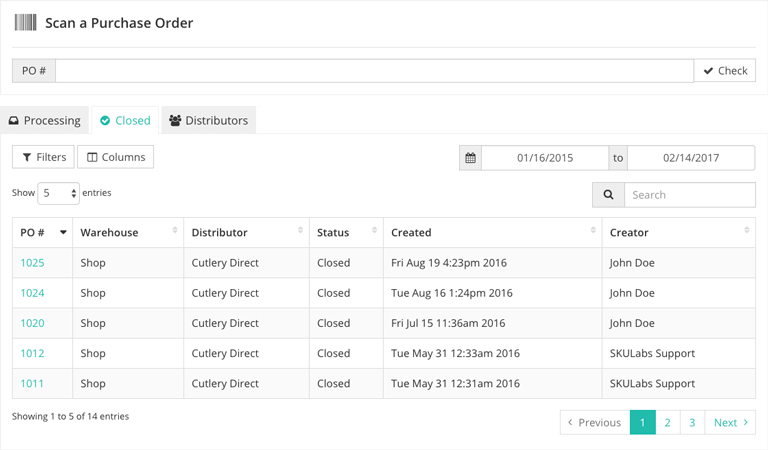 The Closed tab allows you to manage closed purchase orders within a given time range. Closed purchase orders are those that have been received and closed by a user in your warehouse. PO #: The unique identifier that was manually entered or automatically generated when the purchase order was created. You can manage a purchase order by selecting its PO # and going to the Purchase Order page. Distributor: The distributor that the purchase order was submitted to. You can manage your distributors in the Distributors tab.